Taking the steps to become a corrections officer is ideal for anyone interested in a criminal justice job within jails or prisons. Corrections officers are trained guards responsible for watching over inmates who’ve been arrested or sentenced to serve time. Corrections officers supervise the activities of prisoners and closely inspect facilities to enforce important security rules. Currently, the United States employs around 474,700 corrections officers in local, state, and federal prisons. Although there’s an increased emphasis on rehabilitation to reduce inmate populations, jailers will continue to be in demand. The Bureau of Labor Statistics predicts employment of corrections officers will grow by four percent through 2024, thus creating 17,100 more jobs. Below is a step-by-step guide showing how you can become a corrections officer. Having a high school diploma is the minimum requirement for corrections officers. However, a growing number of prisons are requiring some college coursework. Earning a certificate or associate’s degree from an accredited community college may be sufficient. If you’re planning to work in a federal prison, a bachelor’s degree is mandatory. Aspiring corrections officers should major in correctional management, criminal justice, law enforcement, police science, or a related field. Passing courses specifically on corrections, incarceration, and probation or parole is recommended. In some cases, military experience can substitute a degree. New corrections officers typically will complete a training academy for on-the-job training before starting their first shift. Most local and state prisons mandate that corrections officers complete at least 160 hours of training. Federal prisons require a minimum of 200 hours of formal training at the Federal Bureau of Prisons center. This will involve learning about self-defense, prison safety, corrections laws, crisis management, restraints, and firearms. CPR certification is also included. In-service training can last several weeks or months depending on the agency. Next, you’ll begin applying for jobs as a corrections officer at the local, state, or federal level. Officers in federal prisons must be U.S. citizens, be appointed before turning 37 years old, have a record clear of felony convictions, and have passed a preliminary drug test. 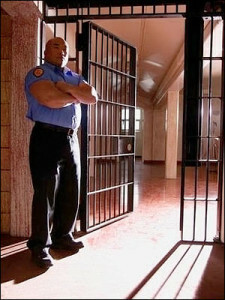 Corrections officers are thrust into a potentially dangerous workplace with violent criminals, so experience is a must. The Federal Bureau of Prisons commands that corrections officers have at least three years of work experience in law enforcement. Staying up-to-date on new correctional procedures is key for even experienced officers. Most jails and prisons require continual training every year. Pursuing professional certification can help assist in meeting education requirements while advancing your career. Through the American Correctional Association (ACA), you can become a Certified Corrections Officer (CCO). You’ll have to take a certification exam and score above 75. Scoring 90 or higher will add the “Honors” designation to the certificate. Being certified can help you become a correctional sergeant, supervisor, and even warden. Overall, corrections officers play a pivotal role in maintaining order and safety among inmates held in jails or prisons. Not only do corrections officers watch closely to spot contraband, conflicts, and security breaches, but they also may aid in prisoners’ rehabilitation. On average, corrections officers earn a yearly salary of $44,910, or $21.59 per hour. Corrections officers are employed in the public sector with good benefits and clothing allowances. If you become a corrections officer, you’ll build a career focused on enforcing the punishment of convicted criminals.